Eileen Neff’s most recent exhibition, Traveling Into View, is a reflection on her time spent at Monte Azul, an eco-resort/nature preserve/artist residency in Costa Rica. Monte Azul’s website describes itself as existing “on the road less traveled… designed for those well traveled,” a motto that easily lends itself to an urban artist craving experience “away.” The promise of this is fitting for Neff, whose work frequently deals with reformatting landscape to reckon with issues in the realm of contemporary exhibition: vibrant landscapes photographed through the window of a moving train, C-prints of epic cloudscapes sitting on the floor and casually leaning against the wall, trees made geometric by forceful framing devices. The tropical jungle seems both a logical extension of Neff’s repertoire and a challenging bit of chaos for her subtle aesthetic. Neff chooses to handle this environment in multiple ways: with romantic ideations of nature, an acceptance of the impossibility of its representation, and an appreciation for the artifice of framing. Rather than providing a gateway into an immersive experience, Neff gives us a series of windows – some blurry, some partially obscured, and some which (gently) bend the boundaries of reality. Traveling operates as a commentary on the nature of experience, of the ability to absorb, remember, and catalogue new information in a short period of time. This constant motion – edging toward and away from – is stilled in a pair of photographs featuring a young man holding a reflective surface in front of his face. In First Scene the reflected rainforest is distorted, stretching outward in a psychedelic sea of greens and grays, butting up against the rigidity of the mirror’s round shape and the hands gripping it. Second Nature reflects a deep space of rolling mountains and clear sky, which is so sharply vibrant that the clouds almost appear to move. The human face in both of these images is completely masked by the landscape, one interpretation a warped appropriation coming into view, the other so hyper-real it seems impossible. These photographs clearly articulate Neff’s desire to pull and push the viewer from experiencing the landscape she investigates. Neff plays with this idea using familiar veins that run throughout her oeuvre, particular tools that she uses to deconstruct and reexamine imagery. 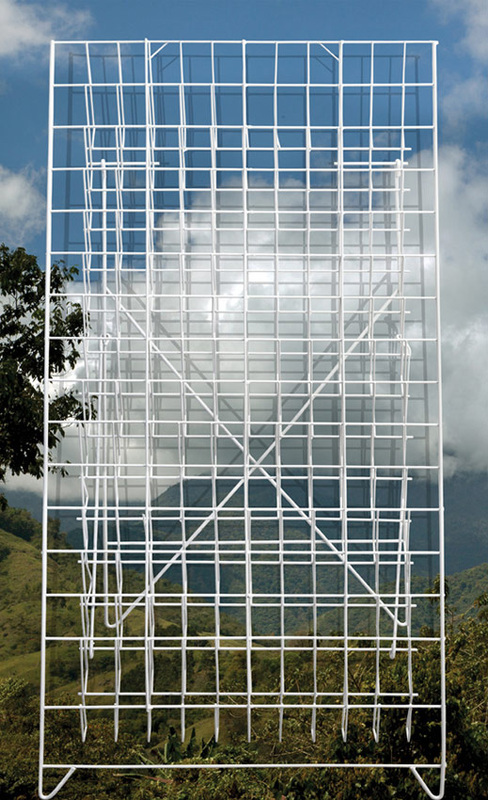 The symbol of a magazine rack – used in International Forest (1990) and Postcloud (2012) to reconstitute natural images through the frame of postcard-sized photographs placed within the rack – appears in two prints in View, digitally superimposed onto two landscape photographs. The rack serves as an organizational tool, breaking the images up into bite-sized pieces. It is also an intruder into the pastoral, flattening the infinity of nature behind an incongruous piece of furniture. 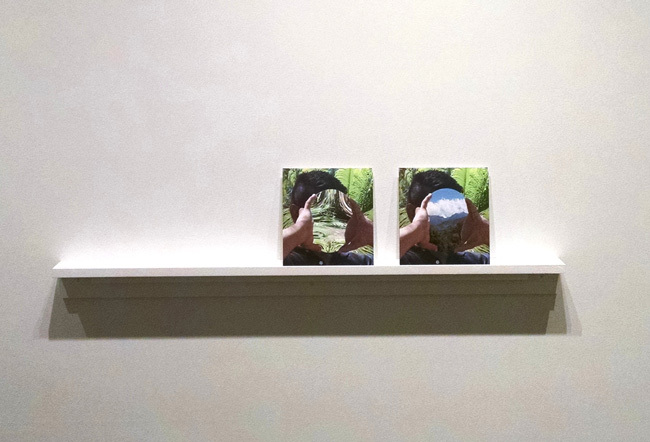 One of these photographs – Pre-Viewing – immediately arrests the viewer as they enter the gallery. Leaning on a pedestal next to the airplane window photograph, a distant valley is almost comically interrupted by the white metallic rack, which casts a distinct shadow onto the surface of the photograph, aggressively asserting its two-dimensionality. 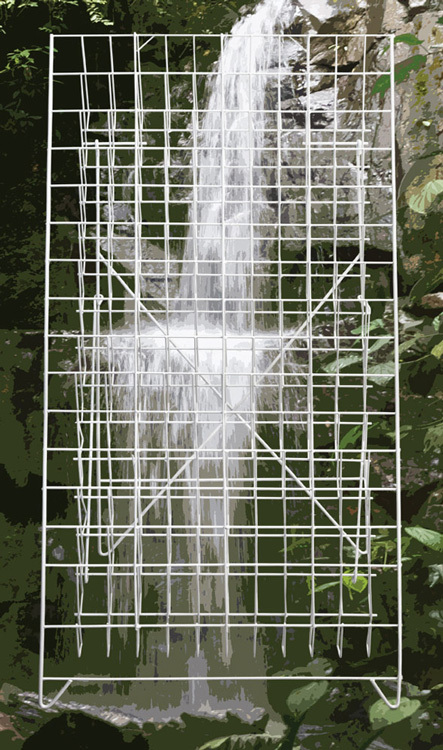 The second magazine rack appears in Waterfall, a digitally altered photograph with bulky, pixilated divisions between values. 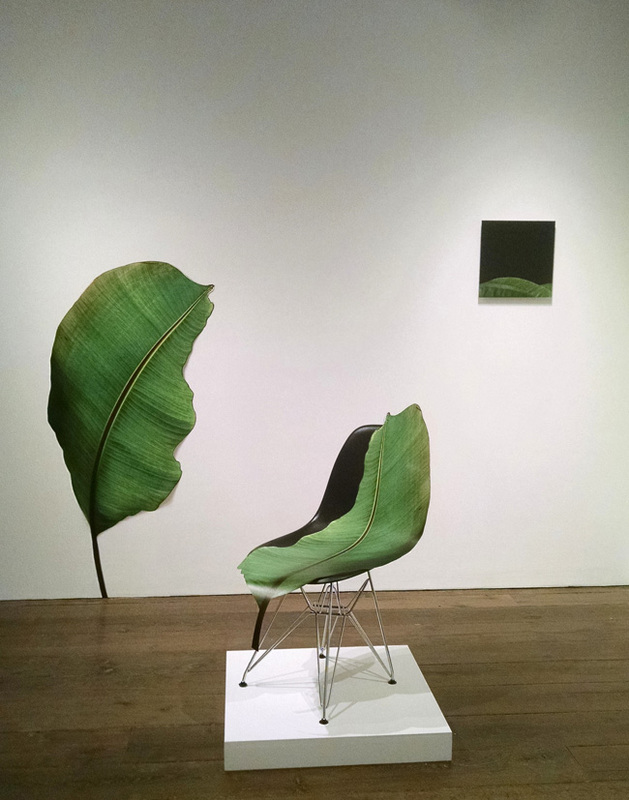 Placed at the back of the gallery, it seems like a strange artifact of memory, the immediacy of the vibrant jungle greens absent from its washed-out final state. As bookends to this exhibition, Pre-Viewing and Waterfall keep the containment of the rack on the viewer’s mind throughout. The most literal (albeit playful) attempt at an organization of experience is in Leaf Wall Installation, a series of photographs of leaves isolated on blank backgrounds. 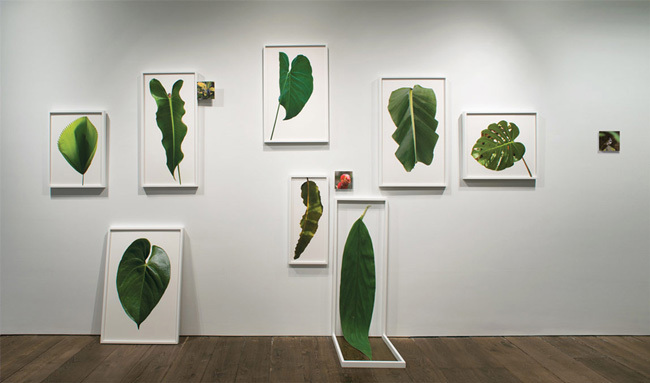 In this collection of images, leaves are seen from distinct perspectives, folding and rippling as they would hanging from their respective plants, rather than as flattened specimens. This kind of taxonomy, which prioritizes experience with these plants in the world rather than their specific botanical attributes, plays with the structure of ordering within individual experience. Floored, in which the leaf literally slides off of the wall (the white frame bending onto the ground to accommodate this slump), embodies the artist’s particular approach to the systematizing of natural imagery. In playing with the dimensionality of the frame, Neff stretches the definition of the space it contains, even in this more rigid format of arranged specimens. Artist residencies are, in some ways, a nod to a time when being an artist meant having a place to claim for one’s own inspiration: JMW Turner and the British Isles, Cézanne and Mont Sainte Victoire, Georgia O’Keefe and Ghost Ranch, and more recently Roni Horn and Iceland. A landscape can operate as an artist’s trademark, and in an increasingly urbanized world, residencies offer up the experience of being truly immersed in and inspired by nature. While the images that comprise Traveling were created in a singular space, the information they maintain is in a constant state of flux, moving away from and toward a literal interpretation. The viewer is kept at arms length from their place of origin – a complex jungle inconceivable in the white cube of a gallery – and it seems safe to say that the artist is as well. What remains are fragments of moving through space, of thinking about how to hold onto experience, which itself is inherently intangible. Samantha Dylan Mitchell is an artist, writer, and teacher living in Philadelphia.